Having a sweet tooth makes me crave for ice cream every now and then. And ninety percent of the time, I give in, buy one, and regret it moments later. Haha! Do you experience it too? I have always reminded myself to cut down my sugar intake but screw these friends who always tempt me but screw myself more for allowing them to tempt me. Lol. That's why I'm glad that an ice cream shop in my hometown called Aysken D' Han opened and offers premium ice cream that will leave you guiltless. Guiltless? Ice cream? Do they really go together? Yes! Just continue reading to know why. Aysken D' Han is located in Suba-Basbas in Lapu-Lapu City. We went there after visiting 10,000 Roses and had lunch at Lantaw Native Restaurant. So from Lantaw Restaurant, we rode a tricycle going to Gaisano Grand Mall Cordova and from there, we rode another tricycle going to Suba-Basbas. We just told the driver that we're going to Nissi Academy. When we arrived in front of Nissi Academy, the driver asked us if that was where he'll drop us off, so I instantly searched for any signs of Aysken D' Han and saw it few meters across Nissi Academy. I told the driver to drop us at Aysken D' Han ahead and so he did. The store is on the same part of the street with Pacific Grand Villas Subdivision. You can easily spot Aysken D' Han because of its simple and industrial design. And as you can see, the exteriors of the store are painted with words related to ice cream. Upon entering, we were greeted with their staff and told us that they just opened. We arrived at exactly 1PM so it was a perfect timing. The space inside was small and can only accommodate two people (refer to photo above). After we ordered, we went to their garden because it was the perfect spot for photo taking purposes. But then it started to drizzle so we went to the front area instead. While waiting for our orders, they served us these cookies and it was good. It had a nutty and buttery taste. Zayn enjoyed the cookies and dipped them in his ice cream. It's no secret that Sheen and I are cheesecake lovers. Whenever we go to a cafe, we always check if there's a cheesecake in their menu else, we go out. So I'm glad that Aysken D' Han offers cheesecake. And what makes it better is it's an ice cream cheesecake! Two of our favorites in one dessert! YUMMM! Berry Chocolate Ice Cream Cheesecake is something I have not tried before but it tastes uniquely good. For the ice cream, we ordered one for each. Sheen ordered Pistachio, Zayn got Chunky Monkey, and I ordered their alcohol-infused ice cream Tequila Rose. Haha. Alcohol in the middle of the day? Somewhat a good idea especially if it's mixed with ice cream! But really, I honestly enjoyed my Tequila Rose ice cream. Sheen loved the Pistachio and Zayn loved his Chunky Monkey as well. Right when we were about to finish our desserts, their staff approached us and asked us if we loved our orders. We said yes. She went back inside the store and then a few minutes after, she went out bringing this cute tray of truffles. We said we didn't order any but she said that she's giving it to us for free as we are first time customers. But I'm not sure if that's always applicable but it's okay. 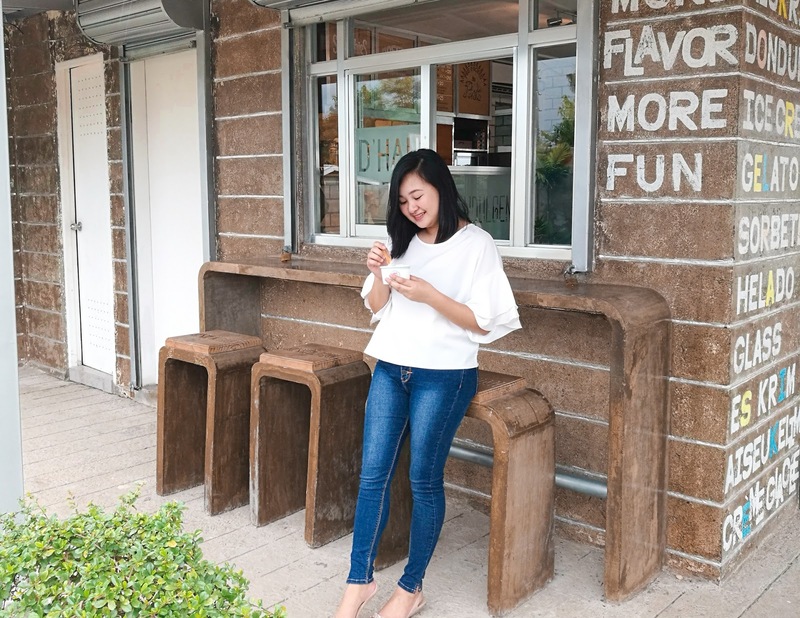 With freebies or not, Aysken D' Han is a must-visit ice cream place. So what really makes Aysken D' Han different from the other ice cream shops? They serve 100% organic ice cream. They only use ingredients that are 100% natural which are imported from the different parts of the world. They have vegan and vegetarian ice cream options perfect for those who are health conscious. Which is why I said that eating ice cream at Aysken D' Han won't make you regret it after. At first, I thought it has a foreign-sounding name. As I was scrolling through the photos, saka ko lang na-realize that it sounds like ice-candy-han. HAHA. Loooove healthy & organic ice creams, too. And what I like more about them is that they produce unique flavors compared to commercial brands. Would love to try the alcohol-infused one! How does it taste?